By Michael Henry, Diploma of Science & Fitness Professional Level 2. I remember starting out in this industry around a decade ago and recall that things were a little different back then. What we know “for sure” today is not on par with what was “for sure” back then. The average amount of cardio recommended for fat loss was 3 sessions of 20mins, high repetition sets of weight training were meant to get you trim and toned and eating fat was a no no. Since then the first two points I mentioned have faded and been replaced, but interestingly, FAT is still a dirty word. Its reputation has been tarnished in the grandest fashion and the recovery of fats image still seems quite far off. But fear not my friends as after all the media bashing here are a few points to ease your mind when it comes to eating fat. Good fat (including animal fat) is GOOD for your health. 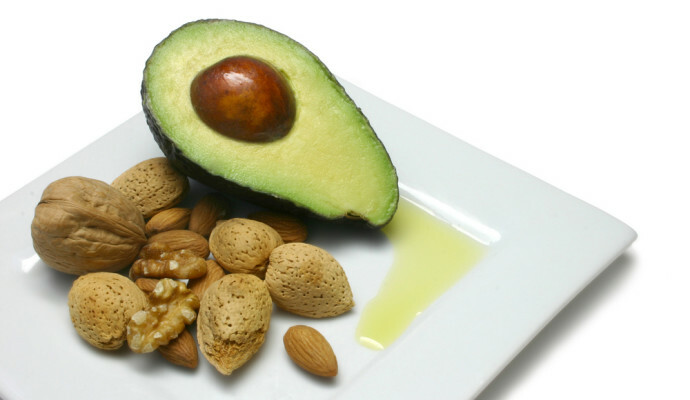 The nutrient-rich fats from animals raised in their natural environments, on their natural diets, are amazing sources of vitamins A, D, and K. These vitamins communicate to your body WHERE to lay down calcium – which keeps bones strong and arteries clear. Not only that, but the dietary dogma surrounding saturated fat, cholesterol, and heart disease has been called into question based on an extreme lack of solid evidence. It now looks like vegetable oils, like canola oil, margarine, soybean oil, and corn oil are the REAL dangers. Good fat doesn’t make you fat. The media LOVES to tell us that “fatty foods” are making us fat. But what is ALWAYS wrapped around those so-called “fatty foods?” High-carb highly-processed garbage that causes inflammation, blood sugar spikes, and total hunger insanity. And even whole grain pasta, bread and crackers can have that same crash-and-burn affect! Why do you think we’ve been told to “eat every few hours” to keep our metabolism going? Because politically-correct, fat-free food causes hunger, energy, and blood sugar dips and spikes that have to be constantly “re-upped.” Think a drug addict “coming down” from a high. And often, the media is focusing on bad fats anyway. Fats that have been processed into oblivion. Fats from animals raised on unnatural diets (remember, you are what your food ate). And don’t even get me started on artificial trans fats. Good fat is THE anti-hunger, anti-crash food. 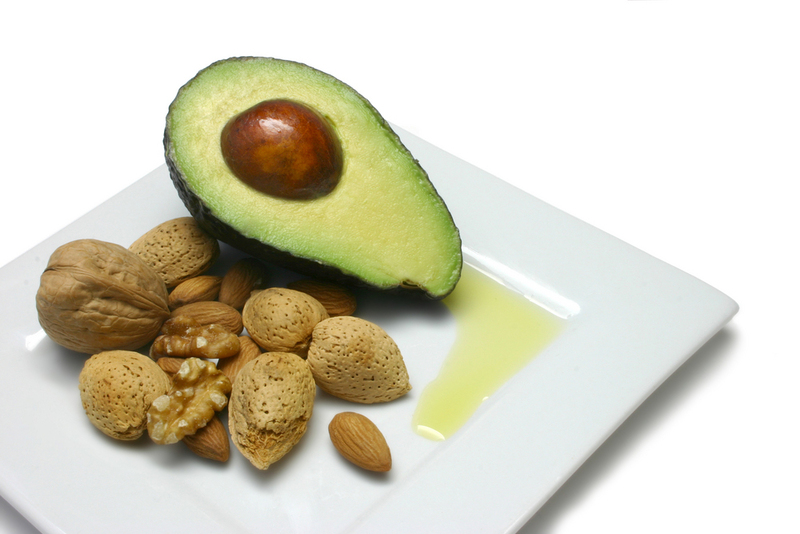 Fat does NOT demand an insulin response, so there’s no energy crash-and-burn when I eat it. Fat stimulates the hormones that signal fullness, and not just the type of fullness that comes from stuffing your stomach. This type of fullness comes from having REALLY nourished yourself with stabilizing, nutrient-rich fats that healthy people have eaten for centuries. Not only that, but fat keeps the MENTAL crash at bay. Cholesterol helps stabilize the brain – in fact; the brain is made up partially of cholesterol. Fat-soluble vitamins and hunger control are not the only benefits you gain from good fats they are also critical to building a healthy mother that can in turn, grow a healthy baby. Vitamin A from animal products, like egg yolks, is a critical nutrient for fetal development. Good fat also provides the raw materials for hormones and hormone balance, which is critical for a woman’s ability to conceive. Did I mention vitamins A, D, and K? These fat-soluble vitamins are little miracle workers, and a huge proportion of the population is deficient in them. Why? Because we’ve been told NOT to eat the foods that contain them. Instead, we take multivitamins with synthetic forms, which may actually be dangerous. Never try to replicate what mother nature can already do perfectly herself. We obsess over being able to eat MORE and stuff ourselves MORE, but what’s wrong with having a few bites of calorie-rich, nutrition-rich, health-promoting food? You’d be surprised at how well-regulated the hunger signals, and your relationship with food, becomes when you give your body the raw materials to be not just full of calories, but full of NUTRIENTS. Place salmon steaks into a ceramic dish. Add teriyaki marinade and turn salmon to coat well. Stand for 20 minutes. Put rice into a saucepan and cover with 2 cups water. Place over high heat and bring to the boil. Simmer for 5 minutes or until craters form over rice. Cover and turn off heat. Heat a frying pan or cast iron chargrill over medium-high heat. When pan/grill is hot, place a piece of baking paper in pan – this will stop the fish sticking. Cook 2 salmon steaks for 2-3 minutes on each side for medium-rare or until cooked to your liking. Transfer to a plate and cover with foil to keep warm. Repeat with remaining salmon. Divide rice between 4 plates. 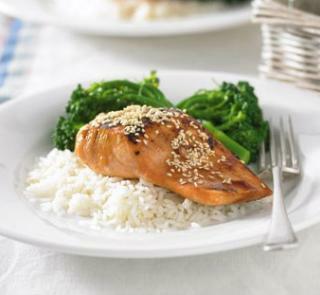 Top with salmon and sprinkle with sesame seeds. Serve with steamed greens.